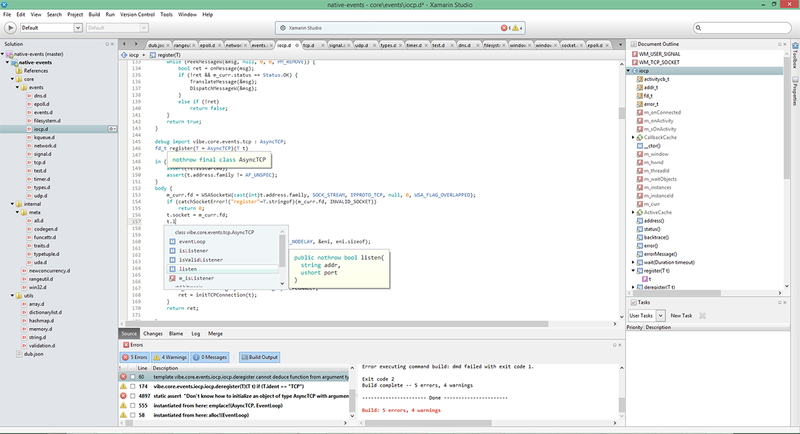 Mono-D brings D support to the cross-platform XamarinStudio/MonoDevelop IDE. Ad hoc DUB support. Despite the package.json/dub.json file not being a native format that is supported by the Mono/.Net facilities, there's still a bunch of things wrapped for being used within MD. 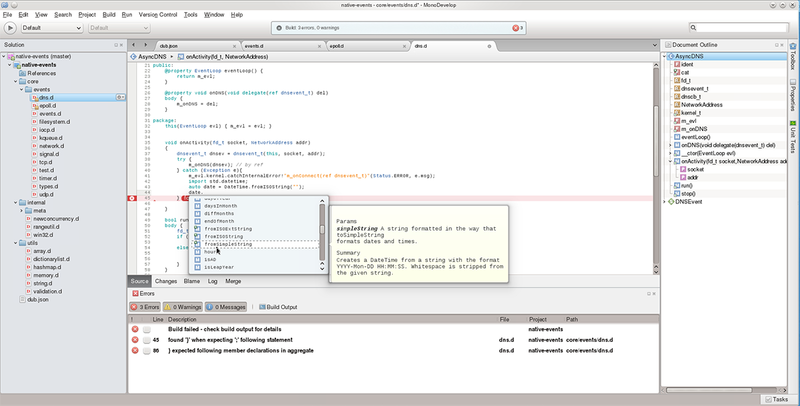 Note: Xamarin Studio is basically a slightly different but still generally freely available version of MonoDevelop. In the following, MD can be seen equally to XS. You'll need XS/MD >v5.6 to be installed for Mono-D.
Go to http://monodevelop.com/download, download & install the latest MonoDevelop setup. Note that there's a gtk# package required to be installed as well. Launch XS. Open the Help menu (Windows) or the Xamarin Studio menu (OSX) and select 'Check for updates'. Select the Alpha channel to be used for searching updates. Generally it's recommended to stick to the latest 'Alpha' version of XS because only then, you'll get the very latest & most recent changes & bug fixes. In my very long experience of using XS, it's usually not the case that an Alpha version behaves unstable. Check your distro's software manager for any recent MonoDevelop version and try to install that one. MD >=5.6 is mandatory due to massive API changes etc.! If no proper build hasn't been uploaded, go to http://simendsjo.me/files/abothe and download the .xz matching your OS architecture. Follow the instructions given in the readme.txt in order to deploy everything properly. The archives are maintained by me, so please check the site regularly (like 1-2 times per month) for updates! Add apt repository: sudo sh -c "echo 'deb http://download.opensuse.org/repositories/home:/tpokorra:/mono/xUbuntu_14.04/ /' >> /etc/apt/sources.list.d/mono.list"
Either via downloading the zip distributables or via your linux distro's package manager. The packages are usually called dmd, druntime and dtools. Note: Before installing any new version of Mono-D on Windows, make sure you never opened any D project since the last start of XS or MD. Otherwise, you'll get some installation errors etc which are caused by the fact that dlls cannot be overwritten once being loaded. You'll find all D-related options in the Environment => D tree item. If the dmd executable cannot be found via $PATH or %PATH, adjust the compiler's bin path in the Compiler Toolchains settings to the absolute path. This also counts for OSX-Installations where XS is somehow not able to pass /usr/local/bin as default PATH entry..so just set the bin path over there as well! Do the same for dub or the Win32 ResourceCompiler.zip. You can of course add custom globally used libraries as well. Note that it's not sufficient to just reference the ...\dmd2\src\-path alone -- the \druntime\src\-folder will cause trouble otherwise because it then would parse runtime source codes twice and then will confuse equally named packages and modules! On Windows, execute 'make symlink.bat' which is located in the repo's root. Adapt the given 'Run'-command path to MonoDevelop.exe to your system's setup. 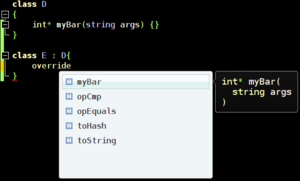 For Visual Studio, there should be a similar setting. 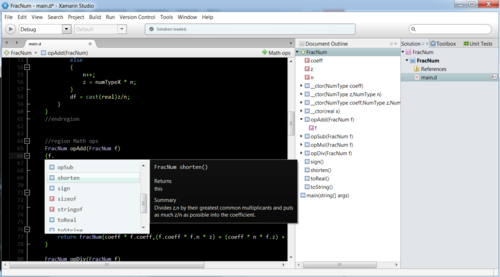 Now you can build & debug Mono-D directly from within MonoDevelop/Visual Studio. You still need a working MonoDevelop and Mono-D installation in order to proceed with the following step! to get e.g. a D project/solution built with Mono-D's facilities. If you only have one .sln existing in a directory, just invoking mdtool inside that directory is also sufficient! Generally it is to mention that XS does overwrite the system's $PATH environment variable when invoking dub or other native commands. That overwritten $PATH does typically not contain /usr/local/bin - which is the reason why many dub setups will fail to work with Mono-D on OSX by default. To fix this, just head to the 'D' -> 'Dub Settings' tab in the global options and enter e.g. /usr/local/bin/dub as 'dub executable'. Then, nearly everything should work fine. Now set /Users/<user>/monod_dub.sh to the 'D' -> 'Dub Settings' tab -> 'dub executable' option. This page was last modified on 16 March 2018, at 11:30.